Laptop armoires can provide an attractive way to set aside a designated area in your home or office to store and use your computer and the associated equipment and office supplies that go along with it. These convenient and attractive pieces are ideal for use in one's home or office, especially when space is at a premium and you want to maintain a neat, attractive look while also having easy access to the equipment that you need to perform work at a moment's notice. Laptop armoires are furniture pieces designed to store notebooks and other small, portable computers in a home or office environment. They typically include a pull-down surface area that can be used as a desk when you need to use your computer. When not in use, you can place your PC on a shelf inside the unit and close the work area so that the unit simply looks like an attractive piece of furniture. They're a great option for small spaces, as they allow you to establish a workspace created with efficiency in mind. They can also be effective choices for large rooms as well, as organizing your computer equipment in a single location can allow you to free up space for other purposes. Regardless of the size of the room you are using it in, you can set up your armoire so that everything you need is right at your fingertips, yet you can easily get it out of sight at a moment's notice. The ideal laptop armoire is designed as a self contained unit, so that you can keep everything that you need to use with your laptop in a single spot that can be hidden away for visual appeal and that is convenient to access any time that you need to work. The best armoires for laptops also have areas to hold peripheral devices, such as a printer, digital camera, external mouse, wireless keyboard, and more. Additionally, they often feature built-in multimedia storage so that you can keep your software applications and/or computer games stored in a spot that is convenient for you to access when you are working with your computer. Using a laptop armoire is a great way to keep your expensive and important computer equipment safe from potential hazards in your living or working area. If you get in the habit of keeping your laptop computer stored in an armoire when you are not on the go, you'll enjoy the benefit of always knowing where to find it and the security that comes from knowing that it is in a spot that is protected from spills, getting lost, being stepped on by accident, or other sources of possible damage. 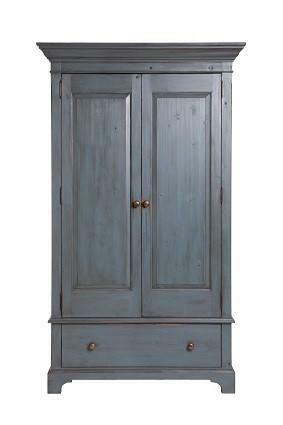 Whether you purchase a ready made piece or you opt to build your own computer armoire, you can easily choose a design and finish that coordinates with your home or office. These types of computer storage pieces are typically made from wood or particle board that has been finished with a wood veneer surface. They are available in a variety of designs and colors to match the décor of any room. You can opt for a painted piece for a country or color coordinated look, or choose a wood stain finish that echoes the shades of other furnishings in the room.